Rosetta is a spacecraft to catch the comet 67P/Churyumov-Gerasimenko (C-G) and answer some of our questions about comets. 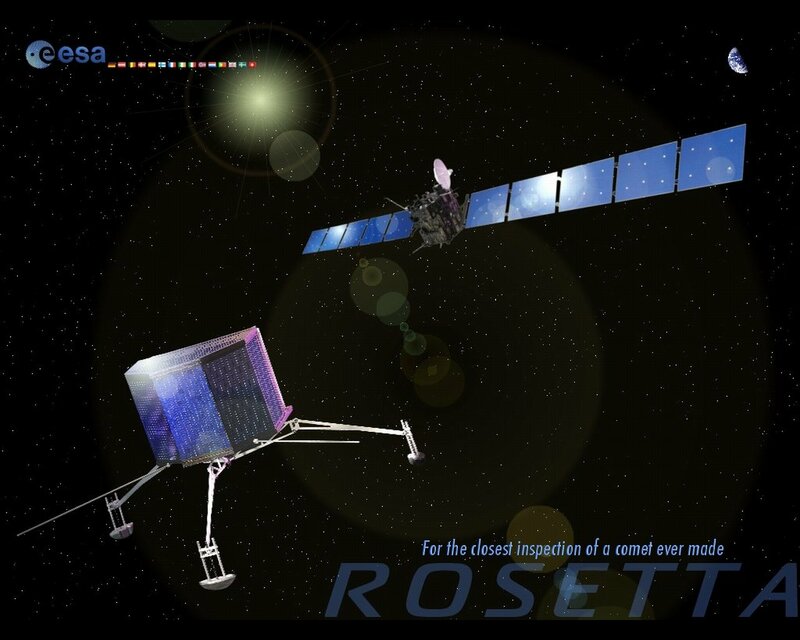 Rosetta will be the first spacecraft to soft-land a robot on a comet! Rosetta will also be the first spacecraft to accompany a comet as it enters our inner solar system, observing at close range how the comet changes as the Sun’s heat transforms it into the luminous apparition that has frightened and inspired people for centuries. The lander is named after the Nile island Philae where an obelisk was found that helped decipher the Rosetta Stone. Just as the Rosetta Stone provided the key to an ancient civilisation, so ESA's Rosetta spacecraft and Philae lander will unlock the mysteries of the oldest building blocks of our Solar System – the comets. Since midle of 1990 years, scientists and engineers from all over Europe and the United States have been combining their effort to build an orbiter and a lander for this unique expedition to unravel the secrets of a mysterious 'mini' ice world – a comet. 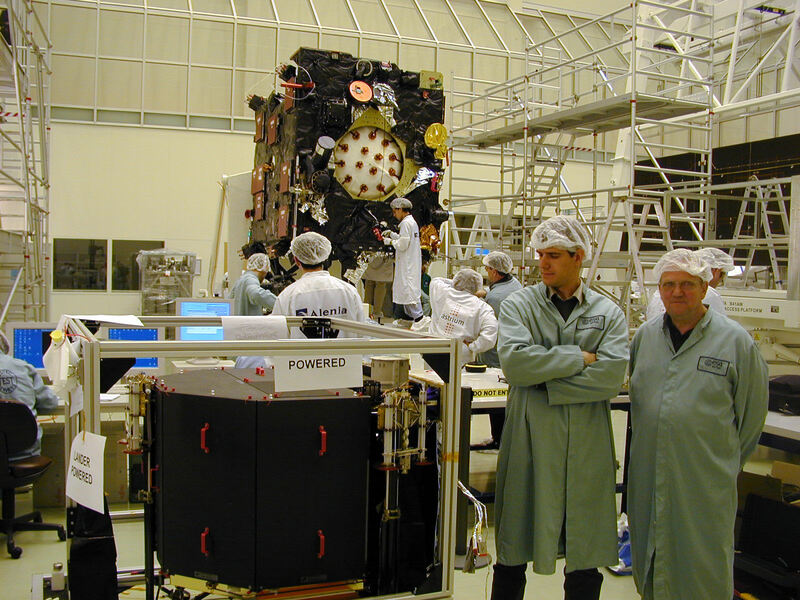 Hungarian scientists participated in the development of the Rosetta Plasma Consortium (RPC) instrument for the Rosetta orbiter and participated in the development of scientific instrumens and subsystems (Command and Data Management System, Power System) for the Philae lander. It was originally to have been launched on January 2003 to rendezvous with the comet 46P/Wirtanen in 2011. However this plan was abandoned after an Ariane 5 failure on December 2002. A new plan was formed to target the comet 67P/Churyumov-Gerasimenko. 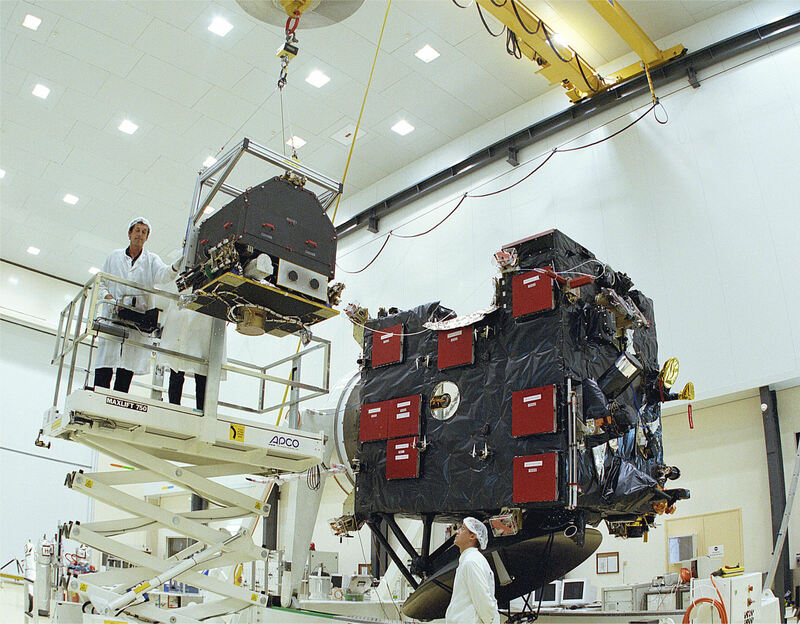 Rosetta was launched on March 2, 2004. Besides the changes made to launch time and target, the mission profile remains almost identical. As before, the Rosetta will enter a very slow orbit around the comet and gradually slow down in preparation for releasing a lander that will make contact with the comet itself. The lander, named Philae lander, will approach 67P/Churyumov-Gerasimenko at relative speed around 1 m/s and on contact with the surface, two will be fired into the comet to prevent the lander from bouncing off. Additional drills are used to further secure the lander on the comet. During a circuitous ten-year trek across the Solar System, Rosetta will cross the asteroid belt and travel into deep space, more than five times Earth’s distance from the Sun. Rosetta first travels away from its home planet and then encounters Earth again. After the first fly-by of Earth in March 2005, Rosetta heads to Mars and then returns to Earth twice in November 2007 and November 2009 for its second and third fly-bys of our planet. The spacecraft has already performed two successful asteroid flyby missions on its way to the comet. 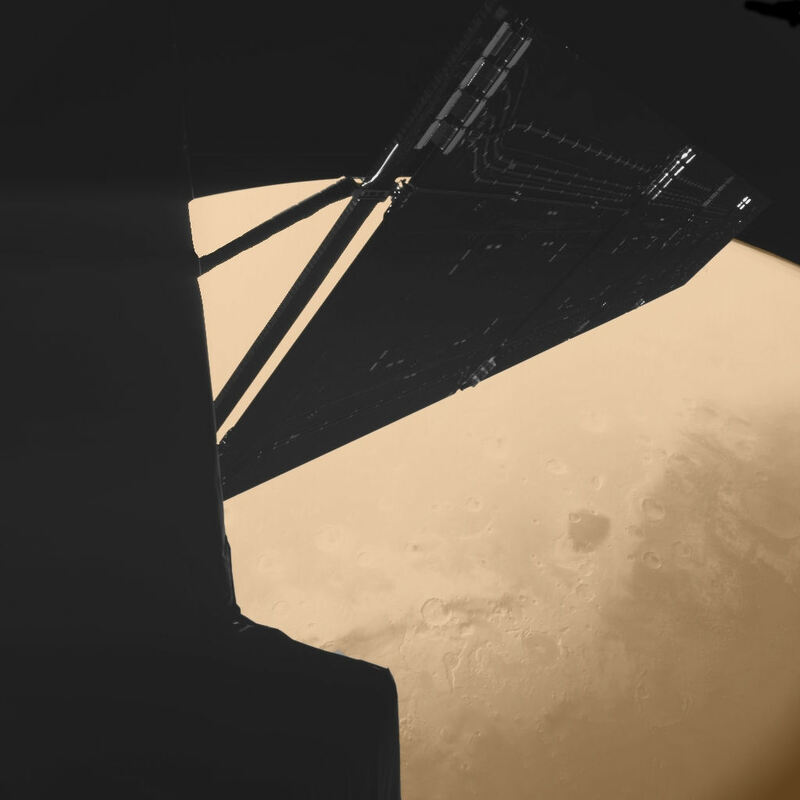 In 2007, Rosetta also performed a Mars swingby (flyby) and tested the Philaes ÇIVA camera. The craft completed its fly-by of asteroid 2867 Šteins in September 2008 and of 21 Lutetia in July 2010. From May 2011 the Rosetta went into hibernation and to fly to its final destination.The Rosetta waked up in January 2014. New software version was successfuly uploaded into Philae's fault tolerant central control and data acquisition computer (CDMS). Rosetta finally arrived at the comet on 6 August 2014. On 12 November 2014, ESA's Rosetta mission soft-landed its Philae probe on comet 67P/Churyumov-Gerasimenko, the first time in history that such an extraordinary feat has been achieved. 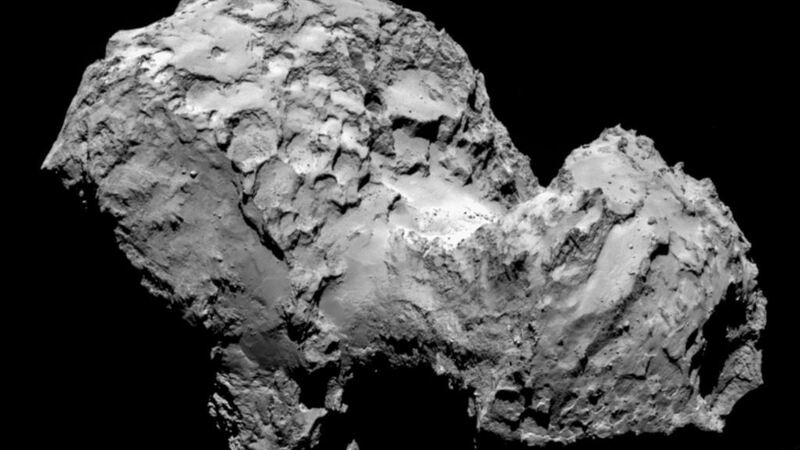 The Philae lander bounced twice before finally settling down on the surface. Owing to the failure of the harpoons, the Philae bounced twice before finally settling down on the surface. In this position, the lander had much fewer solar power, and owing to the large distance from the Sun (~ 500 million kilometres), its accumulators ran out in 60 hours but until that time it did send to the Orbiter many scientific data from all of its scientific instruments. The latest news says that in June 2015, as the comet with Philae on its back came closer to the Sun, the solar elements provided more power and Philae showed a life signal: it answered to the request of the Orbiter. The comet will get its perihelion in August, then it moves back out of the solar system. Until that time, Philae will hopefully provide much valuable information about our strange companions, the comets. The Rosetta orbiter's scientific payload includes 11 scientific experiments (ALICE, CONSERT, COSIMA, GIADA, MIDAS, MIRO, OSIRIS, ROSINA, RPC, RSI, VIRTIS). 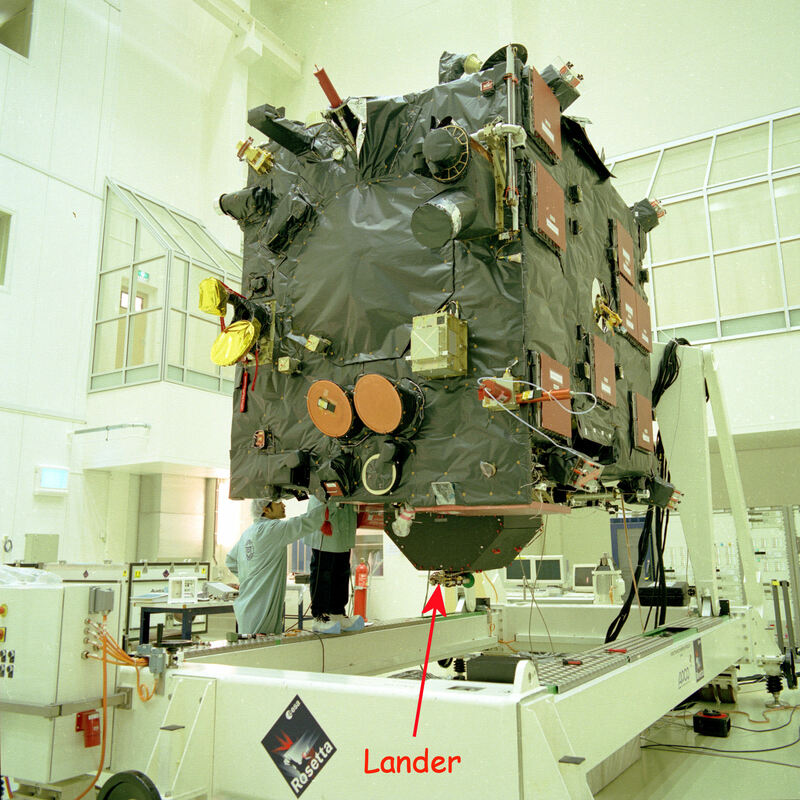 On the lander there are 10 scintific nstruments (APXS, ÇIVA, CONSERT, COSAC, Ptolemy , MUPUS, ROLIS, ROMAP, SD2, SESAME).